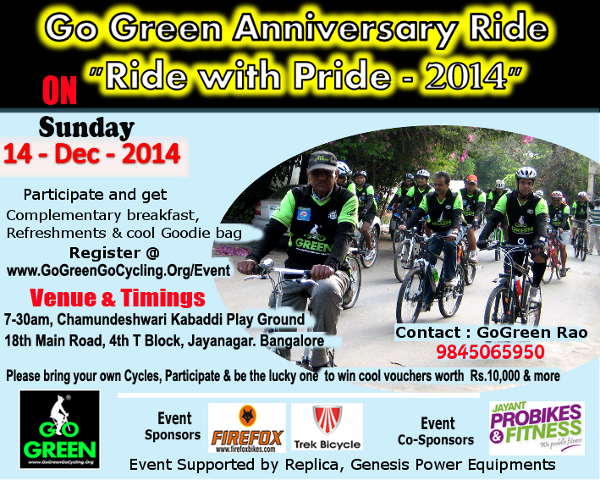 GoGreen - Anniversary Ride "Ride with Pride-2014" on Sunday 14 Dec 2014 - GGI-Group size: 4000+ Professionals, Increasing on day to day basis, Come & join us 2 serve Mother Nature. Sunday 14 Dec 2014, We are glad to inform you all about our 6th year completion of our GoGreen Initiative. with out your support this wouldn't have been possible, We take this opportunity and thank you all for being part of this wonderful family and the kind of success we achieved wouldn't have been possible without your support. details and ensure to cycle with the GoGreen family members and be a pride Cyclist. The first 300 registered participants would get GoGreen bag along with some refreshments as part of Goodie bag. Complimentary Breakfast is being served after the ride. & our Green Initiative to our fellow citizens. 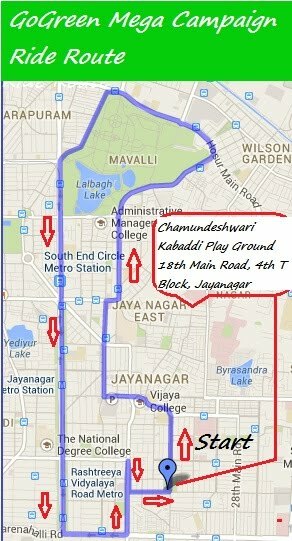 GoGreen Anniversary Ride "Ride with Pride 2014"
Route Map of the ride "Ride with Pride"
Please confirm your participation on facebook too through this link :Please click this link to get on to our face back confirmation page also..